I'm writing this on the third of November; a dark time across the globe, as the mainstream public pretends Halloween is somehow "over" and that there's any reason to move on to anything else. But you and I know the truth. You and I know that October 31st is simply the "middle hump" of Halloween. It always stings a little as the rubber bats and chocolate skulls fade away from store shelves, but let's not think of that as an "ending." 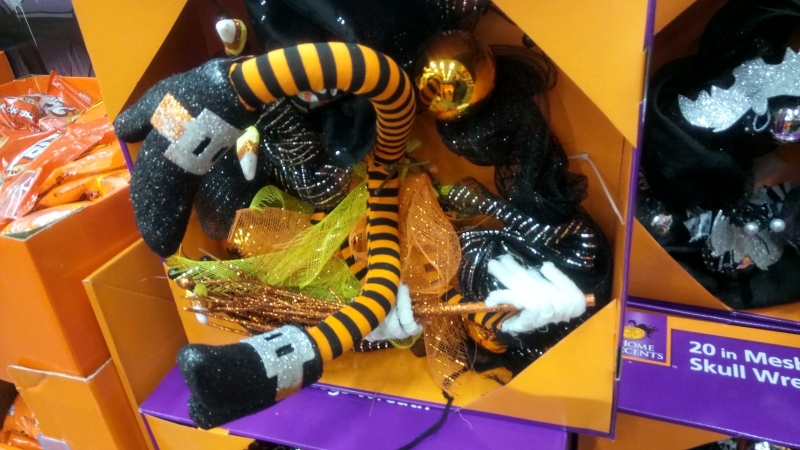 Let's think of the period from August to October as merely Halloween's gathering stage, when we all get to stock up on another year's worth of imitation spiderwebs while we hunker down for the "real" celebration from November to January. 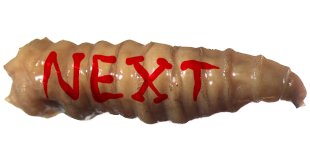 Soon, I'll be putting up this year's information on the creepypasta cook off, and I actually hope to have a lot more "Halloween II" features for 2017 than I did last year, including the return of Nightmare Beings, Creepypasta reviews and who knows what else! Did you know K-Marts still exist? The Halloween products they get in are generally also sold elsewhere, but I didn't have any local stores selling this little guy. Most "creepy" versions of "cute" things tend to try a little too hard, but this bunny looks relatively normal until the red eyes and the cackling, which is a whole lot more fun than just putting bloody fangs on it or something. We reviewed this before they even landed in stores, and weren't able to see what it actually did or hear what it sounded like. It turns out to be at least twice as glorious as I was expecting, and I guess the idea really is that this toaster is also a portal to hell. In the same line as the rabbit, this bear also looks basically normal, and even has a child-like voice, until revealing a bloody human skull under its face, which to me kind of implies a whole complex origin story behind it, like maybe this bear was made out of somebody's corpse for whatever reason. I can understand its disappointtment; if I made a whole dead body into a gift for a child they had damn well better appreciate it. The idea behind these is that you place them in a bathroom facing the toilet, and any motion will set them off to do their various bathroom-related jokes, commentary, and sometimes a weird little song. Maybe I could have set one off all on its own for you, but I think this is a whole lot more entertaining. 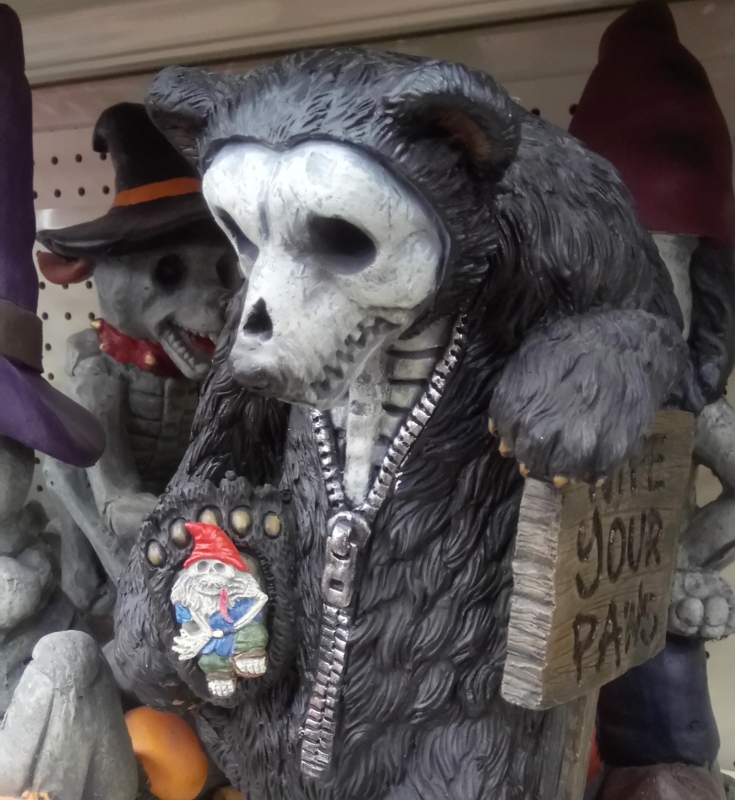 This is part of the same family as the skeletal garden gnomes, dogs and cats I've seen elsewhere, but this one is a skeleton bear squishing a skeleton garden gnome, reminding us to "wipe our paws." More notable, of course, is the fact that this skeleton bear wears the entire skin of a regular bear as a custom hoodie, complete with a zipper, which is so awesome I can almost forgive the fact that its skull has both a skeletal nose hole and a regular flesh nose on it. A smaller, plainer skeletal garden frog remains one of my favorite items from this series, but they've also got a far bigger bonefrog with a witch's hat and surrounding mushrooms! I might have totally flipped for this a couple years back, but these days I'm a little more discerning of something that demands $30 out of me. 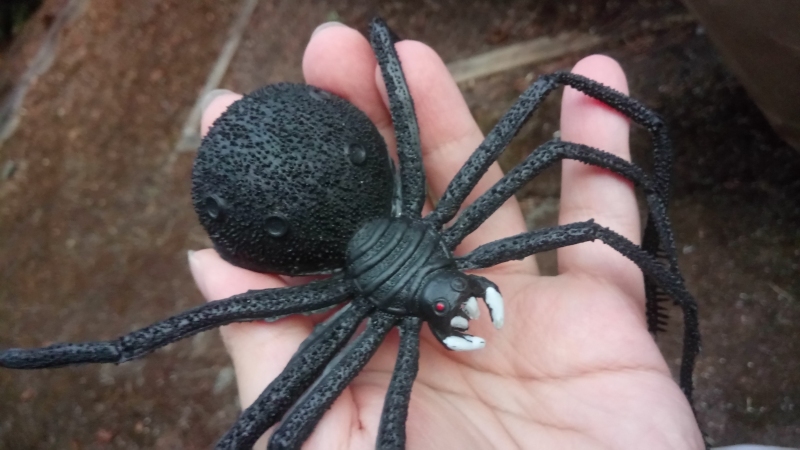 I have owned or encountered somewhere around fourteen billion different kinds of rubber spider in my lifetime, but surprisingly, this bendable latex specimen is the first I've ever seen sculpted with babies. Why, that's so adorable, I can almost forgive that they gave it three body segments instead of two! I suppose it could just have a somewhat pinched cephalothorax resembling a distinct thorax and head. Maybe. I might have already shown this Sklider, but I didn't take the time to talk about it! 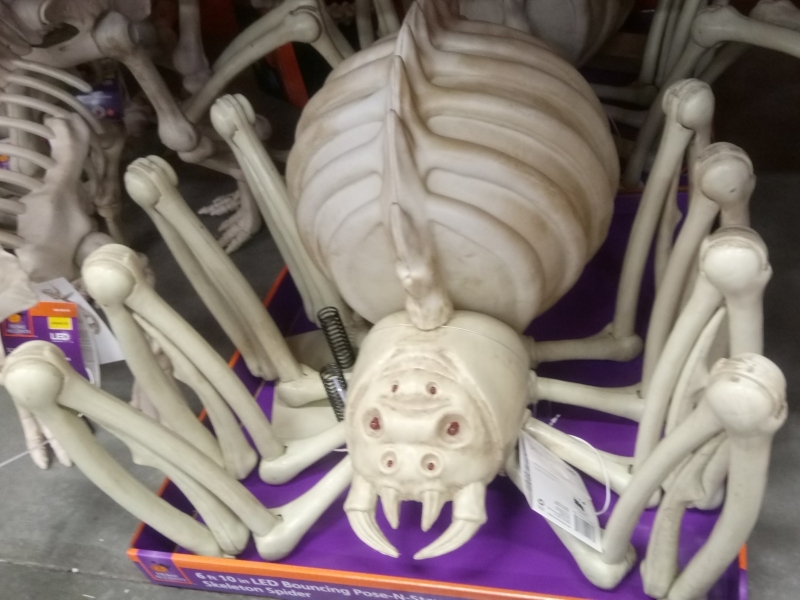 This one is much more accurately spider-like than other larger sized models I've encountered, though it lacks the fully hollow rib cage that would have looked extra cool and could have been filled with other decorations and lights. Still, a bone spider six feet across is pretty sweet, especially with full articulated leg joints to pose! Bi-mart is one of those discount grocery stores where you have to get a membership card, but they were nice enough to let me browse without any bi-card at all! They didn't even ask if I was bi first! 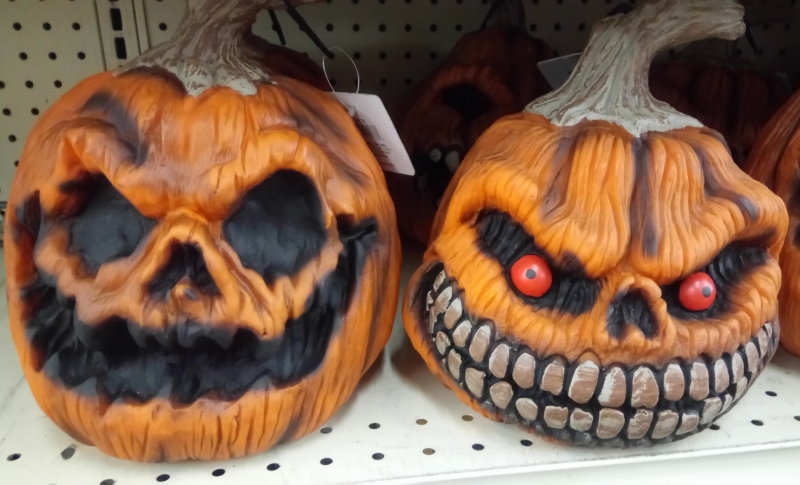 Anyway, plastic pumpkins are kind of a dime a dozen, but these are outright modeled to look old, saggy and rotten, which is amazing. You've got your choice between an almost "normal" one and one with eyeballs and teeth in it, which reminds me heavily of a madball and generally looks cool as heck. Again, this was something a little pricey for me, and by now I'm sure they're all gone, but I strongly admire the thought that went into them. 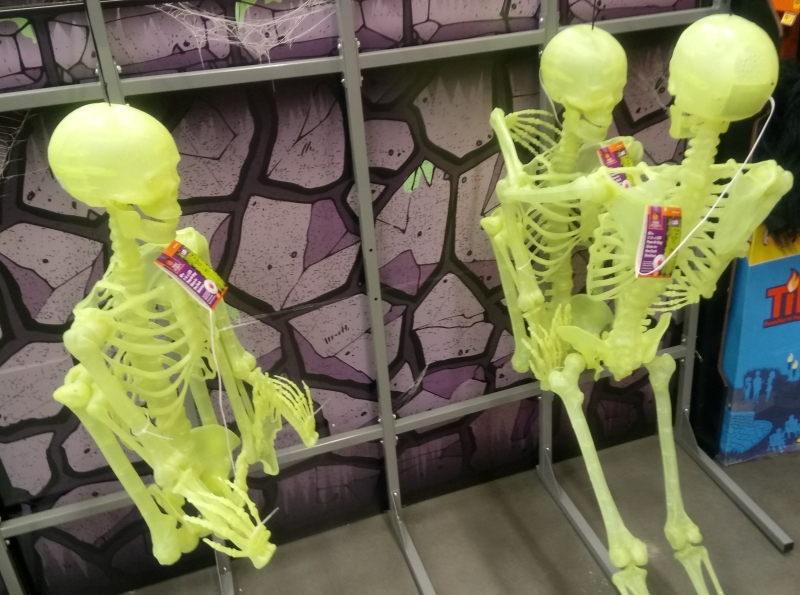 So these were just smallish, hard vinyl skeletons, sculpted in a single compact chunk for around six dollars. Now that's a sweet, simple product with a million and one applications! We've seen wreathes with witch legs before, which is intriguing enough, but this wreathe also had arms and a hat. No facial features. Just a witch whose body happens to be a fuzzy ring of plant matter. Alright! I can dig the HECK out of that! In my Target review this year, we saw a couple of mad science pocket screamers that seemed pretty interesting...but they were gone by my next visit and never stocked again. 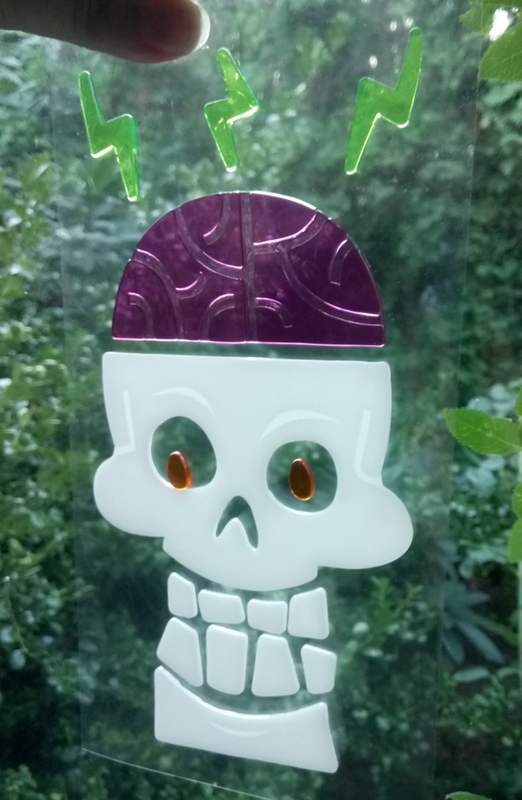 Not until the final week of October did I stumble across this single gel cling set of the same skull-faced mad doctor, lying in the bargain aisle, and discovered that a whole collection of related Mad Laboratory stuff had been stocked at other people's Target stores. I was a pretty frequent customer of ours, and I swear they only ever got in those two screamers and this single cling set. That's the "disappointed" boo, not the "spooky" boo! This didn't make it into my goodwill review this year, because I chose to devote that exclusively to a bunch of cool witches. 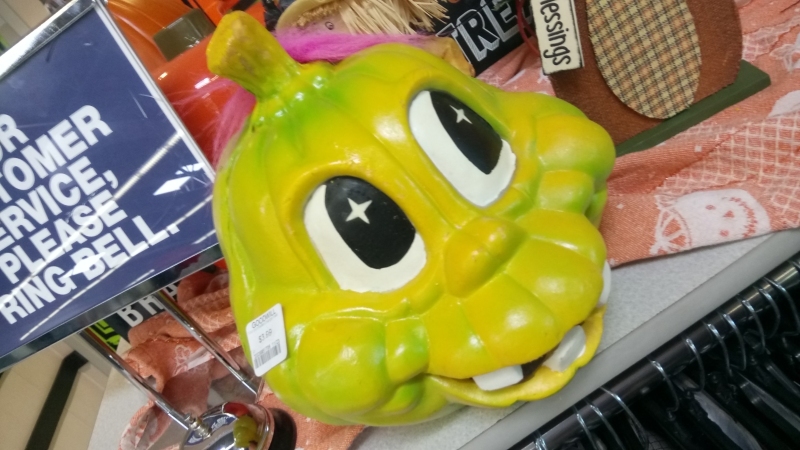 I suppose we don't know for sure if this pumpkin isn't also a witch, but it doesn't have a hat, which is one of the most important possible indicators of witchdom. This is the kind of face that's supposed to be cute, and might be cute to young enough children, but might be equally likely to unsettle them and definitely kind of unsettles me now as an adult. It even reminds me of something highly specific, I'm sure, but I don't really know what. 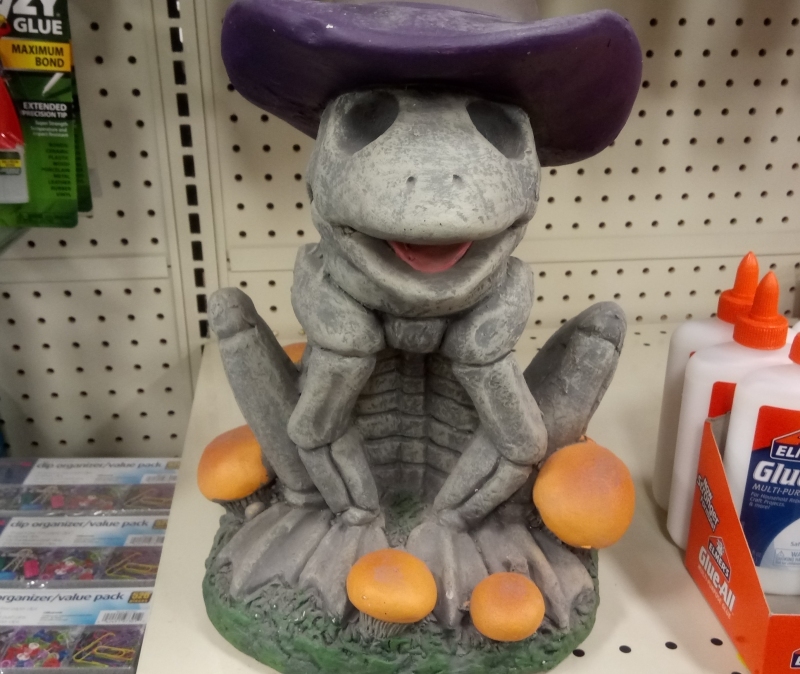 This is another item I didn't find until pretty late, and in this case, only at one of our five or six dollar tree stores. For a buck, it's pretty decent, giving you a mess of human zombies, two different zombie dogs and even two different tombstones! 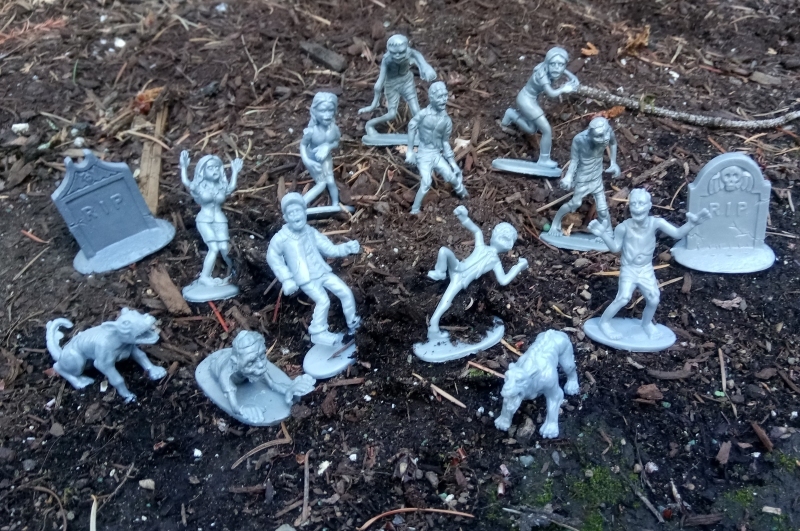 Most of them can't stand upright on their own, but what do you expect when each zombie constitutes only about eight cents of your total purchase, not counting the bonus headstones?! 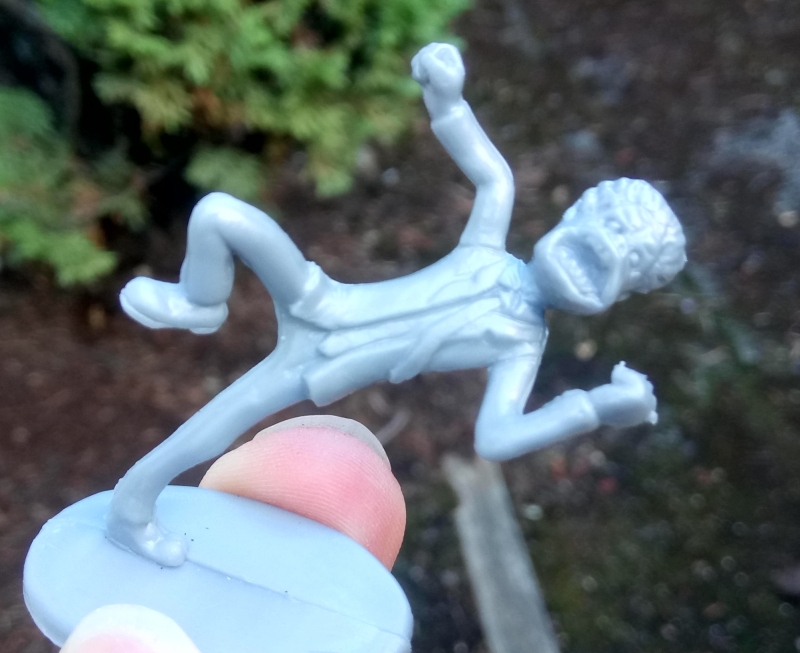 I also don't know what in the world is up with this zombie, but one thing I do know is that I agree. This is another rubber spider of a design I'm not previously familiar with, which is always a delight. It's clearly of the Heebie Jeebie variety. I'm loving the pustule-like pits on the abdomen, ribbed "thorax" and the fact that one of its red eyes was either scraped off at some point or wasn't painted to begin with. I guess "mama spider" up there is probably a Heebie herself. I was too hard on her. I'm sorry. I actually didn't do this. 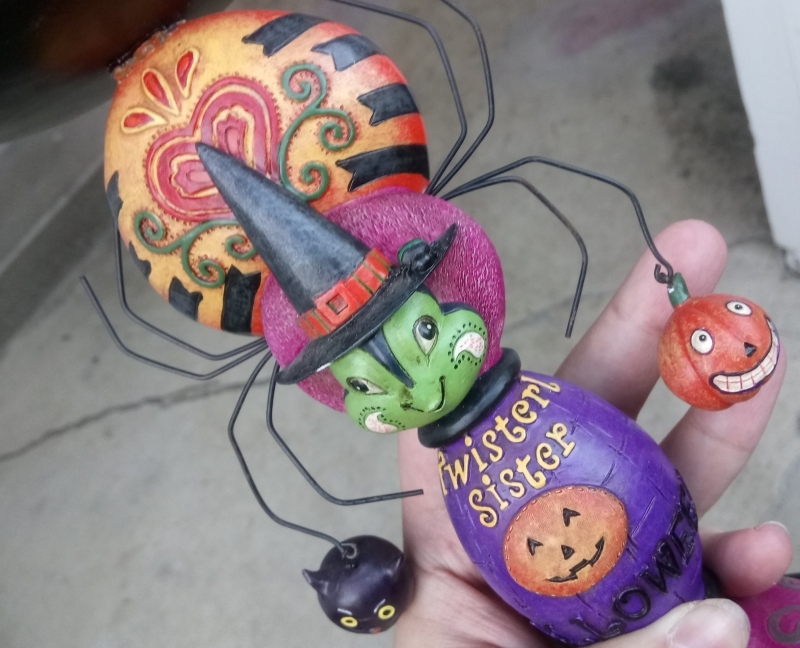 This adorable candlestick features a gorgeously colored, doll-like arachnid witch and what's supposed to say "Twisted Sister," but instead says "twisterl sister" or maybe even "Twisterl sistep," implying a designer who didn't speak English as their first language and may have been imitating an unclear, stylized font. 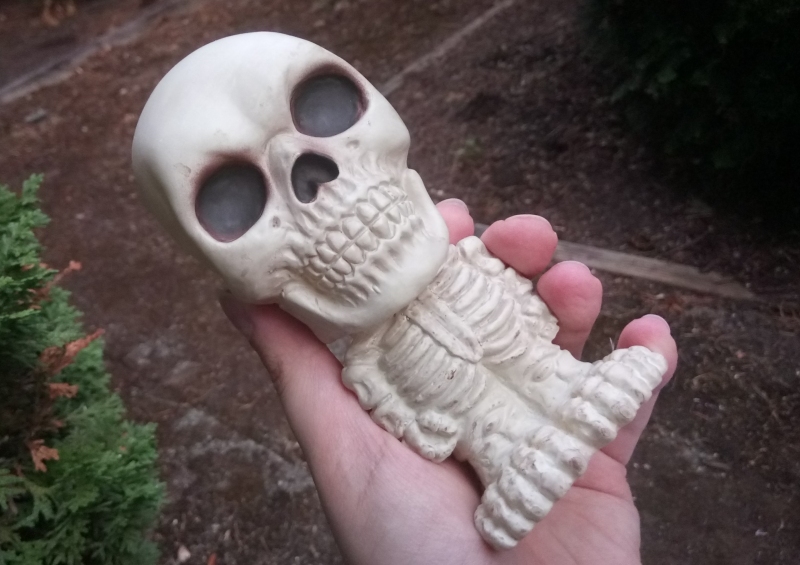 Anyway...this came to me from someone who was selling or giving away much of the Halloween decor collected by him and his wife before she passed away from cancer some time ago. 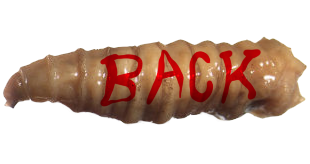 I can guarantee I will be taking the best possible care of Twisterl Sistep that anyone ever could have imagined, if only because that would have already been the case. 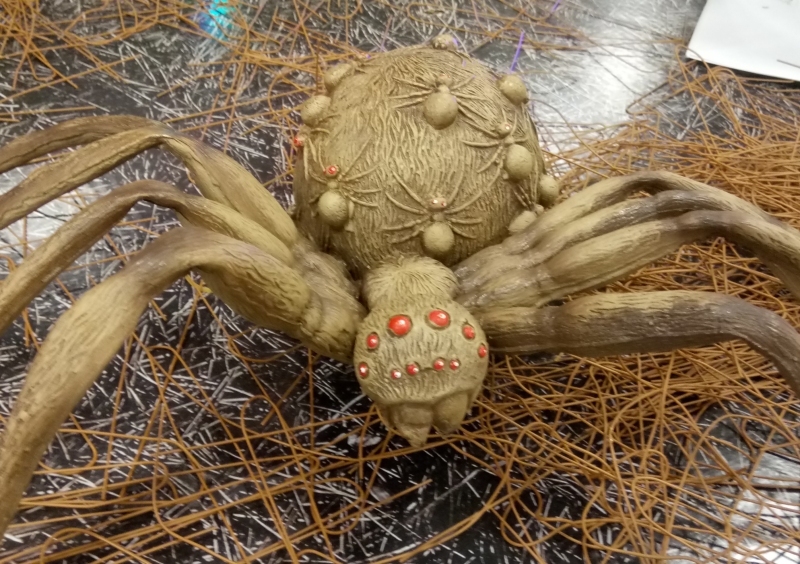 I daresay, as an elaborately decorated spider that is also a witch and also some kind of animated plush being, that the Twisterl Sistep would deserve a pretty high place in some kind of hypothetical Halloween pantheon; an official countess of Halloween at the least, if not in fact a duchess.